*Standard Polyester retains color through multiple washes, Rayon has slightly more sheen, but does not retain color vibrancy in the wash. Polyester is best used on any garment, and is the best all around choice. Use Rayon on items which do not get washed. 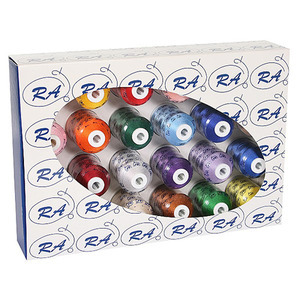 WOW 24 Spools of Robison Anton's best Polyester Embroidery Thread - Assorted Colors in 1100 Yard mini cone spools. The colors may be different from the picture. I was trying to find just spools of Robison-Anton thread, unable to, however the thread I did purchase is just what I needed. Allrands offers the best online deals. The price was very reasonable and the product is outstanding. This was my second purchase from AllBrands. Keep up the good work!! I am greatly pleased with the transactions.